To The NBA Commissioner, media outlets, broadcast partners, NBA players, players union, staff and fans; thank you for reading this and please share your thoughts. 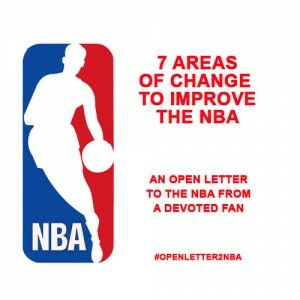 This open letter to the NBA contains a list of seven different areas that affect NBA games and a few suggestions for each that I believe will increase the enjoyment and entertainment value of regular season and playoff games. Keep in mind as you read this, my viewpoint is simply from the perspective of a Houston Rockets fan who’s been faithfully watching since 92, current League Pass subscriber, regular season and playoff game attender. I feel like I’ve invested enough money into the NBA to warrant having my opinion heard. The 7 key areas of the game where I would like to see changes affect how the NBA game is played and presented. Those key areas are the Schedule, Players, Referees, Rules, Scoring, Playoff Format and the Broadcast. The current regular season schedule is 82 games. Teams play other teams in the same conference 4 times and teams in the other conference twice. That’s 2 home games and 2 away games for same conference match ups and 1 home and 1 away for different conference match ups. Simply put, the Rockets would play the Clippers twice in Houston and twice in LA. They face the Bulls once in Houston and one more time in Chicago. Consider changing from the scheduling format mentioned above and switch to a three game format. Each team will play every team three times…two times at home and one time on the road. Flip the schedule the next season and teams get one home game and two road games against each team regardless of conference. Seems simple right? Teams that win the regular season series get automatic home court advantage in the playoffs if they match up with that team. We’ll discuss the playoffs in a moment. This also means we go from 82 games to 87 games ( I think…29 teams x 3 games each = 87 games). I know it’s 30 teams, but like my friend Erik reminded me, they won’t play against themselves. My last adjustment to the schedule addresses player fatigue, injuries and the longer schedule. Games should be every other day. Get rid of the back to backs and four games in five night situations. Give players time for adequate rest and travel. This should reduce injuries and create a more competitive game. The top eight teams from each conference make the playoffs. They match up in traditional tournament fashion with 1 vs 8, 2 vs 7, 3 vs 6 and 4 vs 5. The bracket below shows the 2015 NBA Playoff format (middle of 2nd round when screenshot was taken). I’m suggesting the top 16 teams make the playoffs. I know this has been presented before, but hear me out anyway. How cool would it be if Houston matched up with Miami in 1st round? It would still be a traditional tournament format. The main and most important difference is that the playoff brackets aren’t separated by conference. If teams that matched up had the same record, then the team that won the regular season series would have home court advantage for that round. The playoff format would still be traditional and would be 1 vs 16, 2 vs 15, 3 vs 14, 4 vs 13, 5 vs 12…etc. With that in place, the 2015 Playoffs would’ve been like this. Now, I know we’re accustomed to seeing Western Conference vs. Eastern Conference so the bracket may look weird. Be honest though, don’t the matchups look entertaining and interesting. Chicago vs Portland in a 1st round seven game series would be fun. Rose on Lilliard, Aldridge on Gasol…come on. I had a few barbershop debates with this suggestion. 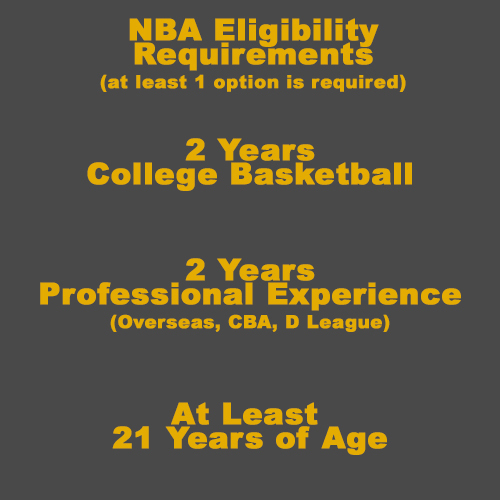 In order to be eligible, players should be required to have at least 2 years of college ball, experience in other professional leagues or be at least 21 years old. Not all three, but at least one of the three requirements. I believe this will provide more experienced players who’ve had a chance to develop and mature prior to joining the world’s most popular game and becoming wealthy. I think this also helps the colleges who struggle to build quality teams due to the high number of one and outs. There are so many rules to the game, all of which are necessary, some can be improved. For example, the bottom circle in the painted area under the basketball goal is called the restricted area. You must be outside of the restricted area when taking a charge or it will likely be a blocking foul. I would love to see the restricted area change to include the entire painted area. This should reduce the amount of charges, flops and rolled ankles that occur in the paint. Another rule change would be for the goaltending call. On the rim tip ins should be allowed similar to the Euro league, and not considered goaltending. We all agreed that blatant flopping should be a flagrant 1. Do you remember the game when Chris Paul flopped without even being touched. That should be punishable with a free throw and possession. Lastly, intentional fouls should only be used if you are losing or winning by 5 five and only in the last five minutes of quarters. Intentional fouls are limited to last 5 minutes of quarter and only if team is winning or losing by 5 or more. The referees need help. The game is too fast and intense at times. I’ve watched so many games that were decided because of a bad call or missed call. I suggest 4 refs for each game and they should be assigned a sideline or baseline and that assignment should rotate each quarter. This gives them a better vantage point for calling fouls and an evenly called game. I really hate it when the ref on one side is calling the game tight so Dwight Howard picks up quick fouls but the other ref is “letting them play” so DeAndre Jordan can get away with being overly physical. I’d also like the refs to mic up and announce the call like NFL refs do. Thank you for reading up to this point. I’m hoping these suggestions and recommendations spark debate within National Basketball Association circles and conversations everywhere. Please share and comment with your thoughts.